Taste test: This was one of the better party mixes I've had, possibly because it was missing some of the less tasty elements found in many party mixes. According to the bag, it includes tortilla chips, BBQ corn chips, crunchy cheese curls, nacho tortillas and pretzel wheels. However, there were no pretzel wheels in the bag, nor any plain tortilla chips (just the nacho cheese ones). The nacho tortillas were quite flavorful, with lots of cheese and a lots of taste. The BBQ corn chips were average, but at least they had barbecue flavor, bringing them one level above your typical party mix corn chip. The crunchy cheese curls were pretty good and quite cheesy. 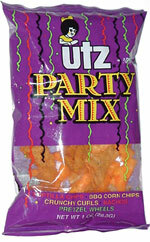 The combination of those three (though it was probably not Utz's intention) is a winner! From the package: There are five separate ingredient lists — one for each kind of snack.